A heart attack is particularly dangerous when it’s caused by blockage in the left anterior descending artery, which supplies blood to the larger, front part of the heart, earning it this scary-sounding nickname. Any heart attack can be fatal. But one particular kind has earned notoriety and a scary-sounding nickname because it is especially dangerous. You may have heard of the so-called “widowmaker” heart attack in the news or on a TV show. But what is it, and why is it called that? The answer starts with the particular artery that it affects. Heart attacks occur when blood clots form around plaque that builds on the walls of one or more of those arteries, blocking blood from flowing. “If there’s no blood flow to the heart, the heart muscles become deprived of oxygen and vital nutrients and heart muscle damage starts immediately,” says cardiologist Mouin Abdallah, MD, medical director of Cleveland Clinic’s Coronary Artery Disease Center. That’s what causes those classic heart attack symptoms like shortness of breath; cold sweats; and severe chest pain, tightness or pressure. A widowmaker heart attack occurs when the left anterior descending (LAD) artery, which supplies blood to the larger, front part of the heart, is blocked at its origin. “This artery delivers a major amount of blood to your heart,” Dr. Abdallah explains. Because it serves such a big portion of the heart, the LAD artery is a particularly dangerous place to get a clot. A lot of damage can be done to the heart muscle if blood flow isn’t restored quickly. But, you can’t tell that someone is having a widowmaker heart attack from the outside. It causes the same symptoms as a heart attack caused by a blockage in a different artery, including chest pain, chest heaviness, shortness of breath, lightheadedness and cold sweats. In women, the symptoms can be more subtle, like neck or jaw pain, nausea and lightheadedness. 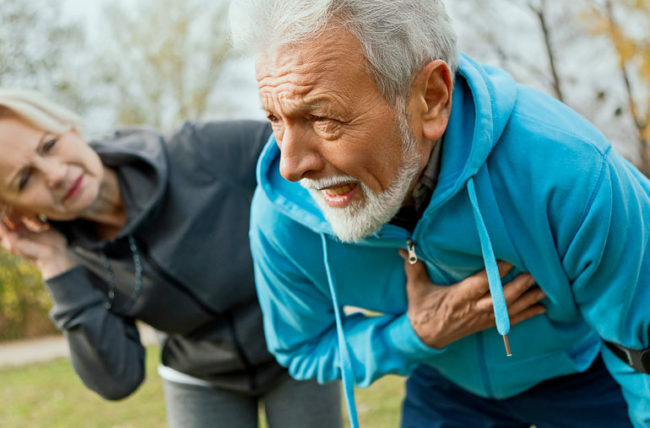 What you should always do when you see someone having a heart attack – or if you think you might be having one yourself – is to get help immediately. Every minute matters when someone’s having a heart attack. The longer blood isn’t reaching certain parts of their heart, the more the muscle will be damaged. The quickest way to get help is to call 911 – not to drive to the emergency room. That’s because paramedics can begin diagnostics and treatment with clot-dissolving drugs en route, as well as feed information to the team at the hospital to help them prepare for the patient’s arrival. At the hospital, interventional cardiologists will determine where the blockage is and clear it using angioplasty and stenting, or bypass surgery. Survival rates following a heart attack have improved in recent years; overall, nearly 90 percent of people who have a heart attack survive, according to the latest statistics from the American Heart Association. The heart is resilient and might recover from a major heart attack like a widowmaker. Patients sometimes are released from the hospital within a few days — especially if they sought medical attention promptly and the cardiologists were able to open the blockages very early. Sometimes, based on the extent of damage, the heart will heal by forming scar tissue, which doesn’t pump as well as healthy tissue. When it comes to any kind of heart attack, “the best thing is prevention,” Dr. Abdallah says. This means keeping your risk as low as possible by not smoking, being active, eating a heart-healthy diet and maintaining good sleep habits. It also means keeping conditions like diabetes, hypertension or high cholesterol under control. If you experience any kind of chest pain, tell your doctor. It could be caused by a number of things, but it could also be an early sign of a heart problem.